For the teleprompter click on the large studio camera in the far left corner. I’m having the same problem as Sheri. I see many TV’s being asked for too but have no idea where where to find this goal either. 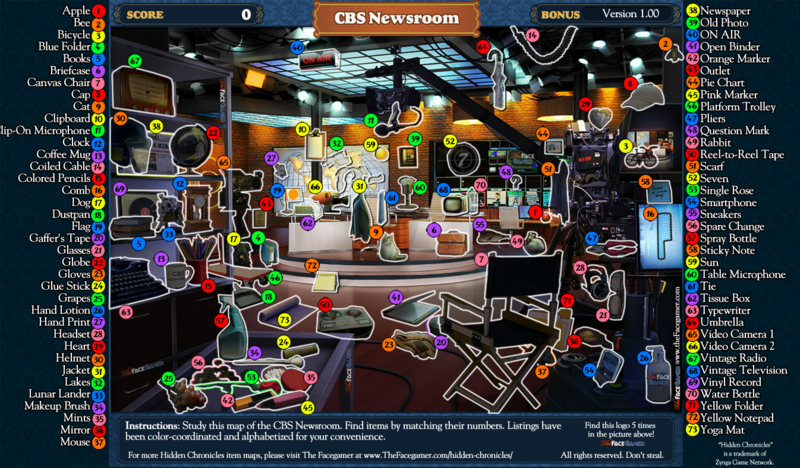 The CBS Newsroom is a FastFind. Go to a neighbor and challenge them to a fastfind, it’s one of the FF choices. Well, I paid to skip the part about watching big brother, because reality tv is not one of my favorite things to watch and those that I do, do not include Big Brother. But so much for spending cash, because it didn’t unlock it for me either. I have to challange someone to play it. Of course, it’s a fast find scene, and if I’m not mistaken it said so in the goal. Anyway, better pay 3 energy to challenge each of your friends and try to find maybe 40-60 or so items each time, than pay 10 energy and get to look only for 9 items. I do not know if you will even see this but wanted to ask you about the Chapter 6 & 7 please. Chapter 6: Imperial Vessel has to be completed before I can get the Turquoise Pagoda. I have completed all but the last one (Ta Garden) that is requiring 50 to unlock. Same thing with Chapter 7… I have to complete it, including Prison Suite and it shows that it requires 60 to unlock. Can you tell me if there is something that can be completed that will unlock those? I know that the bridge had a thing that required 25 for the blueprint but as you worked other things the 2 pieces of the blueprint were given to you. Just wondering if the same thing applies for these two. Thanks so much for your time and all that you do here. It is awesome and looks so overwhelming to me.